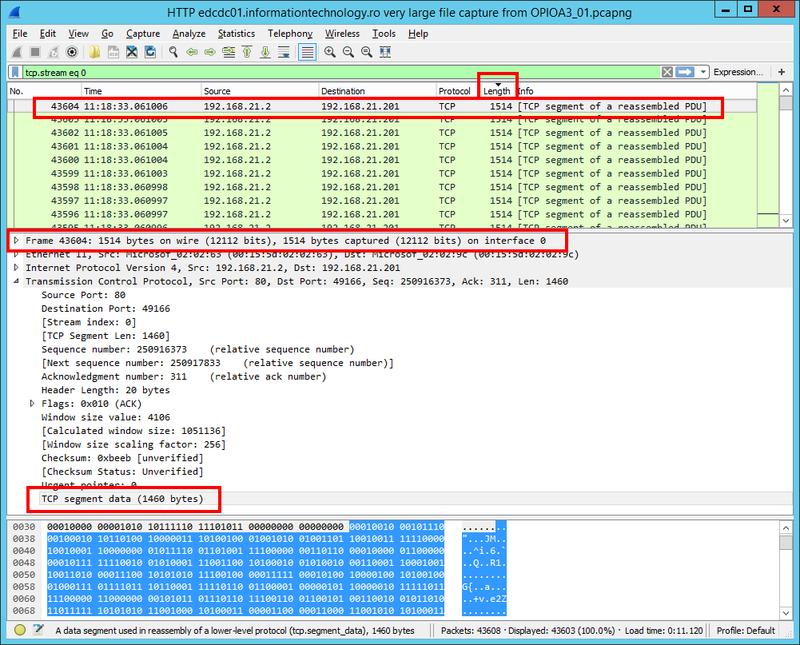 The HTTP/HTTPS IIS network traffic is not that complex, but I will explain in advance what you will see in the next Wireshark and Process Monitor print screens. In a non-academic explanation: IIS will gradually increase the amount of data it sends to the network adapter (depending on how much and how fast the data is transferred), but with LSO enabled the largest frame size is 62834 bytes. 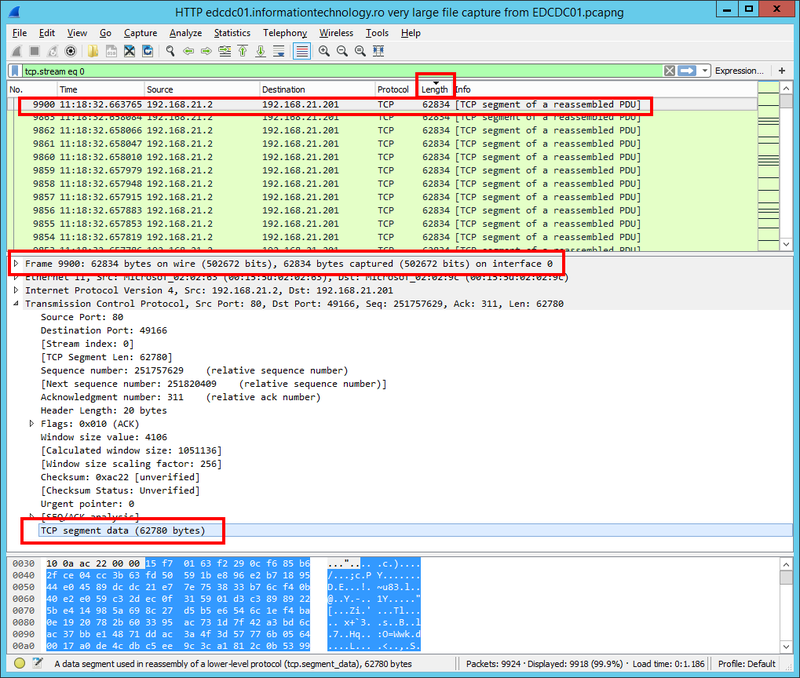 Continuing the IIS HTTP/HTTPS network traffic explanation: actually those data chunks are sent over the network in much smaller size packets. The size of those packets is in direct relation with the Maximum Transmission Unit size. Let’s pause again the explanation and mention in the absence of Large Segment Offload (LSO) (TSO / TCP Chimney Offload) the HTTP/HTTPS data IIS is sending over the network will be directly divided into packets in size with the Maximum Transmission Unit. On the other “end of the wire”, the client system will receive network packets who will not exceed the Maximum Transmission Unit size. At the network level, the HTTP and HTTPS traffic is not that different: we are still discussing about network frames up to 62834 bytes, but in the HTTPS case we can see an increased number of them being sent over the network. This is happening because the encryption adds overhead. The purpose of this explanation is to help reproduce as close as possible the IIS (HTTP/HTTPS) network traffic using IOmeter. Of course, the way the data is handled (processed) before being passed to the network interface card has its performance implications – but this is a different subject. Remember, we look to benchmark only the network. We will try in our analysis to have the minimum influence from CPU, RAM and DISK point of view. IIS is gradually increasing the amount of data it sends to the network adapter (depending on how much and how fast the data is transferred). 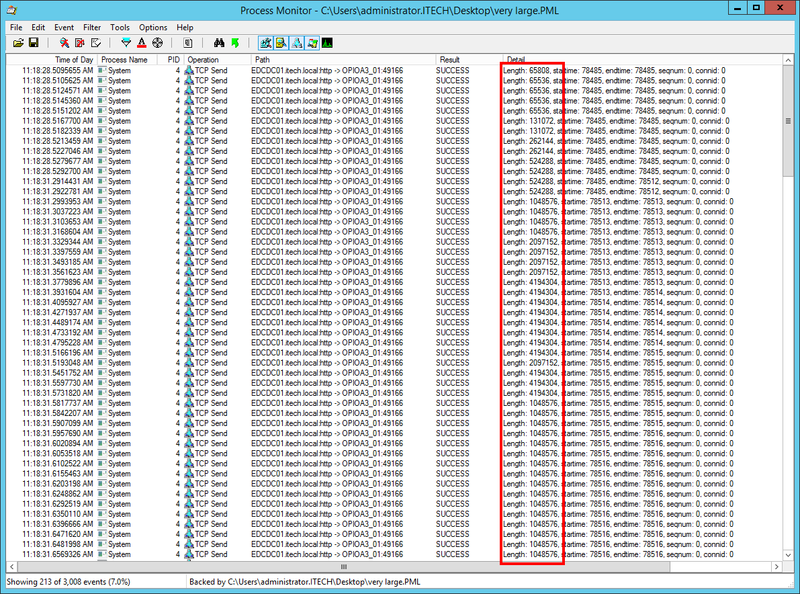 With LSO enabled the largest sent frame is in size of 62834 bytes. On the other “end of the wire”, the client system will receive network packets who will not exceed the MTU size. In contrast with other server software solutions (MS SQL, SMB …) the IIS server doesn’t have a fixed amount of data that is working with, but with LSO enabled the largest sent frame size is 62834 bytes. Again, this explanation will help reproduce as close as possible the IIS network traffic using IOmeter.